Johnson County High School – We partnered with some local churches to provide a special meal for our teachers. Students decorated the library to make a delightful place for teachers to peacefully enjoy their lunch. Students greeted teachers as they walked in on a red carpet by holding the door open and saying, “We appreciate you.” Click here for the photos. Johnson County Middle School. As you can see we really do appreciate our teachers. And as such we made each teacher a sign that says “I’m a teacher. 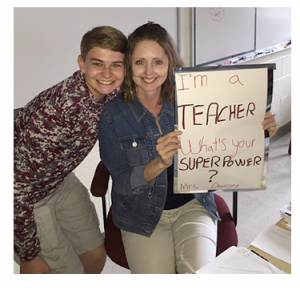 What’s your superpower?” Along with a card and a bag of goodies. Some of the goodies were a flashlight and candy. Teacher appreciation was a big one since it was the most people we have made gifts for ,but everybody enjoyed doing it, and the teachers enjoyed it as well. Click here for the photos.